I had previously written about the 1959 Scouting Exposition held at Ten Mile River Scout Camps in 1959. 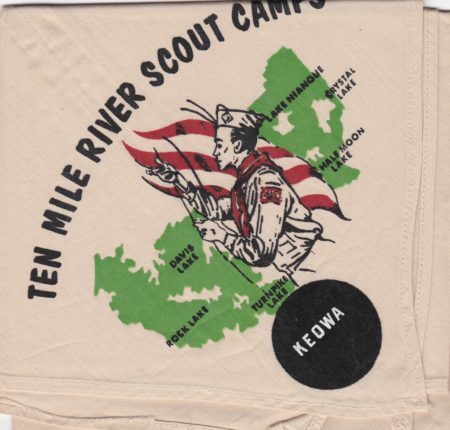 They must have had a stack of these neckerchiefs left over, as there are variations for each of the than active camps created using the base neckerchief with a black circle screened over the 1959 Scouting Exposition and the Camp name overprinted in White. Staff issues aside, this was probably one the earliest examples of memorabilia issued for an individual TMR Camp. Need All other camps, do you have any for trade or sale? I’m originally from upstate NY (Saratoga County Council). I have a fondness for TMR stuff, especially some of their back patches. I also have a fondness for N/Cs with maps of the camps on them. Anyway, that’s my story & I’m stick’n to it.